Skeletons In My Closet Or Is My Laundry Really That dirty! What family that cleans out their closet does not find skeletons? If you are one I want you to email me and let me know because you will be the first. Even the most prominent ones are full of skulls and bones. My family is no exception. Dee sent me the link to the following articles. You see my maternal Grandfather was Roy Fitzpatrick. Roy was the son of Arthur Eugene Fitzpatrick. Arthur was the son of Jane Joiner Fitzpatrick and William Fitzpatrick. Sometimes listed as John . Possibly in some records he could be John William. They were from the Athens, Georgia area. Here are the articles taken from The Southern Banner. A big thank you to Dee for sending these to me. It sounds strange in this land of plenty to hear that anyone has died for the actual necessaries of life. And yet a coroner’s jury impaneled to inquire into the cause of the death of Mrs. Jane Fitzpatrick which occurred Saturday evening, in this city says that she died from disease brought on by starvation. Mrs. Fitzpatrick was the wife of John Fitzpatrick, whom we only know from the evidence given to the jury, but judging from this, he is a man, who scarcely possesses a human heart, so brutal and abandoned does it make him appear. The family lived on Bridge Street near the river. From the testimony of the several witnesses worn we get these facts: John Fitzpatrick had failed or refused his wife with anything to eat for several weeks, and she being in a feeble condition had been compelled to beg for such things she could eat. Mr. Wiley F. Hood had supplied on her several occassions, knowing that he could not hope to get any pay from Fitzpatrick. Mrs. Fitzpatrick had one a little sewing for a lady in the city and with the little money she got for this had managed to subsist, until she finally became too sick and weak to work at all. All of this time her husband treated her in the brutal manner, and not only failed to supply any thing to eat but required her to cook and work for him while she was very sick. He also refused to see a doctor about her and even the night before she died he sat on the bed and cursed her and said she ought to die. The neighbors helped her occasionally, but their ministrations came too late. Dr. J.M. Carlton who saw her said she had contracted intermittent fever and that he prescribed for her, but it was shown that she never received the medicine, her husband refusing to give it to her. She drank a considerable amount of water on Friday night and it is thought, congestion was produced. Her death occurred late Saturday evening. Then the paper went on to say they would have more to say of this matter tomorrow and will give some of the testimony. It is certainly one of the most horrid affairs that ever occured in this city. The circumstances attending the death of Mrs. Jane Fitzpatrick to which allusion was made in the Banner yesterday, were of so unusual and distressing a character that we extract a little of the testimony given before the Coroner’s jury in order that our readers may see how pitiable a condition a woman can be placed in this enlightened country. The inhumanity of the husband is something beyond comprehension. Mr. Wiley F. Hood said that the deceased had nothing to eat that a sick woman would want, except a chicken, for several weeks. Six or eight weeks ago she came to him for provisions and got them. She said that Mr. Fitzpatrick had promised her some money but Mr. Hood did not expect to get pay. He knew she was suffering for something to eat. All she had worked for and bought herself. In his judgement if she had a physician with her at first she would not have died and that a lack of treatment and nourishment was the cause of her death. On several occasions he had furnished her with meal, meat and coffee, she telling him she was sewing for a lady in town and would pay him. She said Mr. Fitzpatrick would do nothing for her. Fitzpatrick had abused her by cursing her, but he had never heard of his striking her. She had been suffering for two months. Dr. J.M. Carlton said he saw her a short time since and found she had intermittent fever. He offered to send her medicine but she did not send for it. He did not think her case dangerous when he saw her. On the night before her death her husband said she had taken a large draught of water. I prescribed her a bath in hot whiskey and some anodyne powders but do not know that they were administered. The water might have caused congestion. Mrs. John Cain said Mrs. Fitzpatrick drank four dippers full of water. Her husband, after much persuasion went to the doctor but brought no medicine back. He told his wife she was a fool and ought to die, and abused her. She was given a hot red pepper bath. Mrs. Mattie Flournoy said when she heard Mrs. F was sick she carried her some butter, bread and coffee. The latter said it was too late, but if she had such food sooner it would have done her good. Mr. F came in and sat on the bed and said that food was enough to kill a well person much less a sick person. Mr. F. told him she was unable to cook and had nothing to cook. He said he was NOT beholden to her or any other damned women. He could get his own breakfast. Mrs. F. said she was unable to work and her husband would not assist her. Mr. V Lemon said that she head Mrs. F say she had suffered for food and that Mr. Hood had furnished all she had for some time. We, the jury of inquest empanelled and sworn to inquire into the death of Mrs. Jane Fitzpatrick deceased, find from the evidence adduced that she came to her death for want of the necessities of life which were failed to be furnished by her husband William Fitzpatrick, and on account of congestion of the lungs, produced by drinking large amounts of water while suffering from intermittent fever. Ph Wright, J.S. 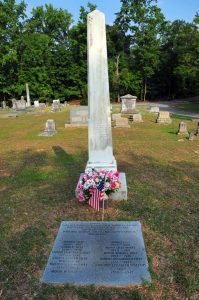 Barnwell, Charles Muse, M. Hodges, WA Wilson, W McKinnon, WS Cranford, F. Walls, WM Peeler, WA Fowler, WM Tolbert, WD Christy G A H Jennings , Coroner. We learn from our Athens contemporaries that William Fitzpatrick starved his wife, Jane Fitzpatrick to death last week, and actually sat upon her bedside and cursed while dying from starvation, neglect and other cruelties at his hands. We hope it is unnecessary to advise our Athens friends what to do with such a man. The Oconee river runs so close to the city, and cord and rocks are so plentiful! Yesterday afternoon the infant child of William Fitzpatrick was buried. It will be remembered that we published the account of his mother’s wretched death a few weeks ago and now the little thing only ten months old, has gone to be with that mother again and thus escaped much sorrow and misery.